Located in Falls Church , Virginia, The O'Neill-James School of Irish Dancing was founded in the Fall of 1969. The school is proud of its well-deserved reputation for quality and excellence. 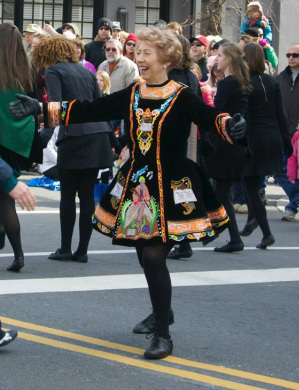 It is the largest Irish dancing school in the Washington, DC Metropolitan area and famous for its participation and excellence in the Saint Patrick's Day Parades of Alexandria and Washington, DC. The O'Neill-James School of Irish Dancing has trained hundreds of excellent students who have competed in the World Championships and performed before the Presidents of Ireland and the United States. 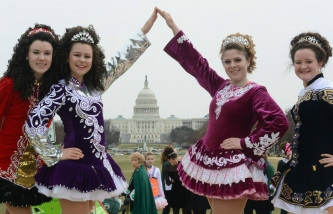 The school established the Nation's Capital Feis in 1987 as the official Irish dancing competition for Washington, DC. Laureen O'Neill-James (TCRG, ADCRG) emigrated to the United States in 1964. She is an "All Ireland Medal" winner, and winner of 263 medals and 25 championships. She was awarded her first medal at the age of four, as were her two sons, Freddie and Robbie, both of whom represented the United States at the 1983 World Championships in Dublin. Mrs. James, who is also an accomplished ballroom dancer, and her son Freddie were semi-finalists on the television program "Dance Fever." In January 1995, Laureen was appointed the first director of the Southern Region of the Irish Dance Teachers Association of North America (I.D.T.A.N.A.). She is a registered teacher and adjudicator with An Coimisiun le Rinci Gaelacha, Dublin. Laureen's parents, Frank and Peggy O'Neill, were the first couple to be inducted into the Irish Cultural Hall of Fame. In November 2004, Laureen was also inducted into the Irish Cultural Hall of Fame at a ceremony held at the Capitol of the United States . By receiving this honor, she also makes history in that it is the first time two entries from members of the same family (Laureen and her parents) are entered in the Irish Cultural Hall of Fame! Along with her husband Fred, she is also an awarded Ballroom dancer and instructor. At the O'Neil James School we are so much more than a dance studio. 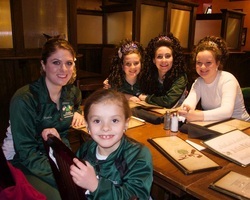 We are a big family who love to dance and learn more about our Irish heritage through dance and other activities. We do semi annual Ceili dances for the families, the unofficial "dads hour at the pub" during Saturday class, participate in numerous local cultural events (see our events page) and our Feis incorporates competition not only in dance but art, soda bread, fiddle, and Gaelic to name just a few. There is no pressure at ONJ to dance competitively though a large portion do.